You are here: Home>Herts history>Towns and Villages>Hitchin>Emily Davies, Suffragette & Founder of Britain’s First Women’s College. Born in Carlton Crescent, Southampton, England to an evangelical clergyman and a teacher, although she spent most of her youth in Gateshead, Davies had been tempted to train in medicine; she greatly encouraged her friend Elizabeth Garett in her medical studies. Davies became a founder member of a women’s discussion group, the Kensington Society along with Elizabeth Garrett Anderson, Barbara Bodichon, Dorothea Beale and Francis Mary Buss who, together, unsuccessfully petitioned Parliament to grant women voting rights. Davies began campaigning for a woman’s right to educate. She was active on the London School Board and in the Schools Inquiry Commission and was instrumental in obtaining the admission of girls to official secondary school examinations. She then advocated for the admission of women to the Universities of London, Oxford and Cambridge. Like all universities at this time, these were exclusively male domains. She also became involved in the Suffrage movement, which centred on a woman’s right to vote. She was involved in organizing for John Stuart Mill’s 1866 petition to the British Parliament) (which was signed by Paulina Irby, Elizabeth Garrett Anderson and 15,000 others) the first to ask for women’s suffrage. That same year, she also wrote the book The Higher Education of Women. In 1869, Davies led the founding of Britain’s first women’s college, with the support of Frances Buss, Dorothea Beale and Barbara Bodichon. Girton College was initially established in Hitchin, Hertfordshire with Charlotte Manning as the first Mistress. The college later moved in 1873 to the outskirts of Cambridge, Cambridgeshire. Davies strongly advocated for a quality of curriculum that was equivalent to those offered to men of the time. Despite the Senate rejecting her proposal to let women officially sit for the papers, Davies continued to train students for Tripos exams on an unofficial basis. From 1873 to 1875, Davies served as mistress of the college, where she then served as Secretary until 1904.The college was not permitted to grant full Cambridge University degrees to women until 1948. 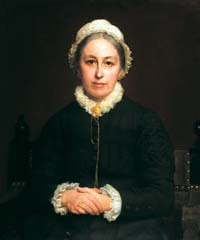 Davies persistent fight for equal education for women was instrumental in the founding in 1875 of Newnham College, which would be led by Anne Jemima Clough. In June 1901, she received the honorary Doctor of Laws (DLL) from the University of Glasgow. Davies also continued her suffrage work. In 1906, she headed a delegation to Parliament. She was known for opposing the militant and violent methods used by the Suffragette part of the women’s suffrage movement, led by the Pankhursts.